Welcome to Joseph Toyota of Cincinnati! We have built our dealership on the idea that every experience for our Cincinnati, Colerain and Fairfield, OH area customers would be easy, true, and clear. No hassle, no hidden fees, and no complicated and confusing answers- just great service and fairly-priced cars. Trust the team at Joseph Toyota of Cincinnati to get you behind the wheel of the vehicle you’ve always wanted. We carry the latest Toyota vehicles, including the 2019 Toyota Tacoma, 2019 Toyota Highlander and 2019 Toyota 4Runner! We also offer a great selection of used and certified pre-owned vehicles of all makes and models. We know purchasing a vehicle is a big decision, and our financing department will is here to help by providing you guidance and finding you a competitive rate. In addition to our team, we also provide a variety of online tools you can take advantage of- from our monthly payment calculator to the ability to value your trade from your couch. When you find your perfect Toyota we are here to keep in running in top shape with our service center and parts department. All maintenance and repairs will be done by factory-trained technicians with genuine OEM parts. 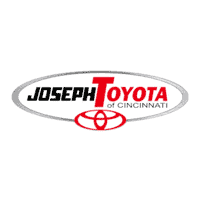 At Joseph Toyota of Cincinnati you always know you are getting top quality.